St John the Baptist's Church is in Vicar's Lane, Chester, Cheshire, England. The church was a cathedral during the Middle Ages, though only the seat of the bishop in practice from 1075 to 1095. It lies outside the city walls on a cliff above the north bank of the River Dee. The church is recorded in the National Heritage List for England as a designated Grade I listed building. 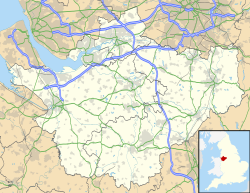 It is an active Anglican parish church in the diocese of Chester, the archdeaconry of Chester and the deanery of Chester. Its benefice is combined with that of St Peter, Chester. Alec Clifton-Taylor includes it in his list of 'best' English parish churches, and it is considered to be the best example of 11th–12th century church architecture in Cheshire. The church was reputedly founded by King Aethelred in AD 689. In 973, the Anglo Saxon Chronicle records that, after his coronation at Bath, King Edgar of England, came to Chester where he held his court in a palace in a place now known as Edgar’s field near the old Dee bridge in Handbridge. Taking the helm of a barge, he was rowed the short distance up the River Dee from Edgar’s field to St John the Baptist's Church by six (the monk Henry Bradshaw records he was rowed by eight kings) tributary kings where a royal council was held. During the 11th century, Earl Leofric was a "great benefactor" of the church. In 1075 Peter, Bishop of Lichfield moved the seat of his see to Chester, making St John's his cathedral. Peter's successor moved his seat to Coventry in 1095, and St John's became a co-cathedral. The building of the church continued on a large scale until the end of the 13th century and continued as a collegiate church of secular canons. Owain Glyndŵr and others made their depositions at the Court of Chivalry inquiry into the Scrope v Grosvenor controversy held here on 3 September 1386. After the Dissolution, much of the east end of the church was demolished and some of it remains as ruins to the east of the present church. Since the Dissolution, it has been a parish church. Parish registers began in 1559, and in 1581 the parishioners obtained a grant of fabric from Queen Elizabeth I to restore the nave as a parish church. In 1645 Chester was besieged by Parliamentary forces who used the church as a garrison. In 1468 the central tower collapsed. In 1572 the northwest tower partially collapsed and in 1574 there was a greater collapse of this tower which destroyed the western bays of the nave. This was rebuilt on a "magnificent scale". There were restorations to the church in 1859–66 and 1886–87 by R. C. Hussey. While the northwest tower was being repaired in 1881 it collapsed again, this time destroying the north porch. The porch was rebuilt in 1881–82 by John Douglas. John Douglas also built the northeast belfry tower in 1886. In 1925 the chapel at the south east corner, then the Warburton chapel, was extended to form a Lady Chapel. The church is built in sandstone. At the west end is the ruined first stage of the northwest tower. The plan of the body of the church consists of a four-bay nave with a clerestory, north and south aisles and a north porch, a crossing with north and south transepts each of one bay, a five-bay chancel with aisles, and chapels at the north and south. The north chapel lies beneath the 1886 belfry tower and is now used as a vestry; the south chapel is the Lady Chapel. To the south of the Lady Chapel is a room known as the Chapter House. St. John's, Chester, England, 1914. While the external fabric of the church is largely Early English in style due to the Victorian restorations, much of the interior consists of Norman material. This is present in the nave, the crossing, the first bay of the chancel, the arch to the Lady Chapel and in the remains of the choir chapels. Richards considers that it is the best masonry of the Norman period in Cheshire. Inside the church are many early effigies which are all damaged, some dating back as far as the late 13th or early 14th century. Monuments to the Warburton family are in the Lady Chapel. In the church are two fonts, one dating from the 15th century, the other from the Commonwealth period. Two brass chandeliers are dated 1722. The pulpit is from the 19th century. The reredos, dated 1876, is by John Douglas and was made by Morris & Co.; it includes a painting of the Last Supper. The organ had been built as a temporary organ for the coronation of Queen Victoria in 1838 by William Hill and Company of London. It was then rebuilt for St John's, transported to Chester by barge and installed at the west end of the church. It was opened on 28 October 1838 with the opening recital given by Henry Gauntlett as he could actually play the pedals. In the 1859–66 restoration it was moved to the south transept and in 1895–96 it was moved to the north transept, when the organ was put in its current case. In the 1960s it was converted to electro-pneumatic action by Charles Whiteley and Company. In 2002 it was restored by Rod Billingsley following vandalism. The organ case dated 1895 is by Thomas M. Lockwood. A memorial to Lockwood is in the north aisle. The stained glass in the east window dated 1863 was designed by T. M. Penson and made by Clayton and Bell. The west window was designed by Edward Frampton and is dated 1887–1890. In the north aisle is a barely visible wall painting of St John the Baptist. The church contains nine memorial boards by members of the Randle Holme family. Also inside the church are fragments of late Saxon stone crosses that are thought to have been originally in the churchyard. The parish registers begin in 1559. Outside the church to the east are ruined remains including parts of former chapels, which are recognised as a scheduled monument. The exterior of the church contains a few tombstones that remain in their original positions. The vast majority of the gravestones have now been repositioned and laid to the ground forming the footpaths immediately in front of the church. In 2009 a research project recorded the inscriptions on the remaining tombs and gravestones. An anchorite cell, originally associated with the church, is nearby.